A catastrophic event could happen as you are reading this. Having a disaster survival kit readily available at a moment's notice may mean the difference between life and death for you and your family. Whether the disaster involves a tornado, earthquake, hurricane, food shortage or even war, being self-sufficient and prepared to capably manage the loss of electricity, gas, access to fresh water and shelter will greatly reduce the risk of needlessly suffering in the aftermath of your own apocalypse. Emergency mini survival kits and auto survival kits are meant to provide you with basic necessities for up to three days. This type of disaster survival kit is kept in cars, boats or taken along when camping or hiking. Hard candy or bouillon cubes. Survival food kits can be packed to last one person three days, seven days or longer. Freeze-dried foods that are made edible by adding water are the best kind of food to pack in these kits. High calorie food of 2000 calories or more and high protein survival bars are also good items for a survival kit. Other items include water purification tablets, sugar packets, candles and plastic utensils. 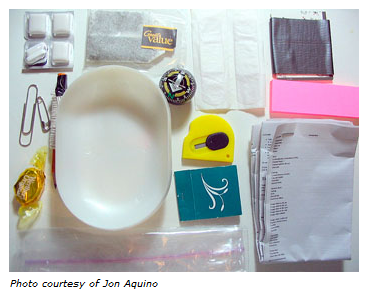 This type of survival kit is packed into a survival backpack and kept handy in case of an emergency. This survival bag, also called a "Get Out of Dodge Bag," was originally a 72-hour survival kit, but some people pack their BOB for longer emergencies. A grab & go bag is intended for serious emergencies that require everyone to leave the area as soon as possible. For disasters that present long-term issues which society must handle possibly without assistance from the government, creating a disaster survival kit is a proactive strategy. A BOB contains certain supplies that may not be needed during short-term disasters, such as a pot for disinfecting water, rubber gas masks and duct tape and plastic. Always have a disaster survival kit available and fully supplied with items that will assist you in surviving any kind of disaster. Periodically check and update it with new and more conducive supplies, which can facilitate your survival in any emergency.